I've been away for quite a while. My surgery last year was followed by complications, lots of them, and it kept me off line for a little bit. I've often thought wow this would make a great blog post, but I didn't have the energy to write it. I slowly started back to my social networks, my candle biz, and other things in my life, and I discovered that I liked Facebook after all lol. So I've decided to come back to blogging, but on a less rigid schedule than I was forcing myself to do before. So some weeks you may see several blog posts, and some weeks you may see no blog posts, and most of you probably do not care one way or another, and that is okay because I'm doing this just for me anyway. So with that said I follow this with my newest blog post "The Great Butterfly Adventure"
So I've been trimming trees for the past two days, we have a very big yard, and a whole lotta trees. I normally don’t mind doing it, but this year the branches that need trimming are bigger, and there are more of them because I didn't do it last year due to of all the problems I was having from that stupid surgery. I have been cursing myself all summer every time I've gotten smacked in the face with a branch while cutting grass. So for two days I’ve cut till the battery dies, clean up branches while the battery is recharging and go back to it; the whole time wanting to kick myself for not doing the job last year. Adding to it the garage repairs, lack of rain, the heat, lack of time and those darn tree branches have kept me from cutting the yard for the last month and a half, making the back yard look like a jungle. Now my husband is going out of town until Saturday, and Bubs is home sick, so I decided to go out while it was still cool, and try to trim up some while the hubs was finishing his packing. The tree I was working on had a whole area of suckers that had gotten out of control, and when he came down to tell me he was leaving I showed him a very large branch I was having trouble cutting through. He took the saw and cut it for me, and I very politely (lol) told him I thought he was hitting me in the face with the branch. When he was finished I still felt something “touching” the top of my head, I brushed my hand through my hair, then finished telling my hubby good-bye, all the while feeling things brushing my arms, legs, and hair. “Darn bugs” I said, and as I brushed the “bug” away again I realized that it was a butterfly, then I saw it was more than one butterfly. We turned and looked, (not quite realizing what we were looking at) and saw a bunch of butterflies flitting through the grass. Bubs is working on growing a butterfly at school, and I asked my husband to see, on his way out, if Bubs felt good enough to come down and see them. So here comes my sick little man, down through the yard asking where the butterflies were. He sat on my lap in the tall grass, and that’s when I realized we were watching HUNDREDS of little orange butterflies! As we sat there they perched in the grass all around us, and Bubs wanted to know if I thought one would land on him. I told him to sit very patiently and to be very quiet, and maybe one would. Now those of you who know Bubs, know that this is a big request for my kid who is always moving, talking, and singing. And still we sat, "I just know a butterfly will land on me" Bubs whispered. We sat some more with butterflies in the grass all around us, enjoying the sun, warm breeze, and with the exception of an occasional cough, the quiet. Finally Bubs whispered “Butterflies will one of you pleeease come sit with me?” … and we sat... and then it happened… a butterfly flew up around his head, and landed on the back of his shirt collar. His mouth dropped, and his eyes grew wide with excitement as he felt it touch the back of his neck, but he managed to sit quietly until it decided to fly away. We sat for a while longer until Bubs’ tummy decided it couldn’t be quiet any longer, and it was starting to get hot, then we came up into the house. As I tucked him in for a nap, Bubs smiled and said “Mommy I sure am glad I was sick today, or I would have missed the great butterfly adventure”. I thought about that after he fell asleep, and you know what? I realized that there is always a silver lining. I've learned as much about the benefits of being patient and still as my little guy, and a good deal about having faith. Know what else? I sure am glad I didn’t trim them trees last year, or I would have finished the trees already, and the grass would have had it’s final cut, and I would have missed the great butterfly adventure too. Last night in order to protect my flowers, and plants from the freeze I brought them inside. This morning when I came into the living room I discovered that while my plants had survived the freezing cold, they had not survived the dog. There he sat all proud of himself and the fact that he had dug nearly everything out of their pots and that he had spread dirt everywhere. My family was happy to see that the favorite herb in our house, and key ingredient in one of our favorite dishes was by some small miracle spared destruction. I placed my pots of basil back outside, and as the day warmed the fragrant smell wafted through the open door. Very soon it will be ready for me to begin to harvest and make this easy, flavor packed, classic dish. Place basil, garlic, nuts, cheese, oil, salt and pepper into a food processor, pulse a few times, and then process until fairly smooth. If you desire a thinner consistency add 1 tablespoon of hot water from your cooked pasta. Place pesto into the bottom of pasta serving dish, and then add your favorite hot, cooked pasta. Toss until pasta is well coated. Sprinkle with Parmesan and serve. To enhance the nutty flavor spread nuts on a baking sheet and toast at 350 degrees for 6-7 minutes or until lightly browned. Pesto can be stored in the refrigerator for one week, or frozen for two months. Pesto's not just for pasta, try on poultry, baked potatoes, or as a spread on a freshly sliced tomato. Hope you enjoy this classic Italian dish! I have been neglecting my blog as of late, and I apologize. I have been tired, a little cranky, and just off my game in general. I can not seem to get back into the swing of things. Hopefully another week or so to recover and I will be back to my old self. In the meantime I will leave you with a little candle knowledge. Air Conditioners, Fans, Humidifiers, De-Humidifiers, Ionic and Regular Air Filters, etc., can all effect the scent throw of your candles, scent simmer pots, plug-ins, and other scented products. So, if your favorite candle, or other scented product doesn’t smell as good as usual, it’s possible that a quick change of location will have you enjoying the delicious aroma again in no time at all. After a few days of lovely green hospital jello, I returned home to find that my family had fixed one of my all time favorite desserts. Strawberry Pie! Add a luscious surprise of hot fudge topping, and you have a recipe that has been a hit at every party, family event, and with all of my oldests daughter's college friends. 1. Heat oven to 450°F. Make pie crust as directed on box for One-Crust Baked Shell using 9-inch glass pie pan. Bake 9 to 11 minutes or until lightly browned. Cool completely, about 15 minutes. 2. Spread hot fudge topping in bottom of cooled baked shell. Refrigerate 1 hour. 3. In small bowl, beat cream cheese and powdered sugar with electric mixer on medium speed until smooth. Carefully spread over chocolate layer in shell. 4. In medium bowl, gently mix strawberries and pie glaze. Spoon evenly over cream cheese layer. Refrigerate until firm, about 1 hour. 5. Just before serving, pipe or spoon whipped cream around edge of pie. Store in refrigerator. 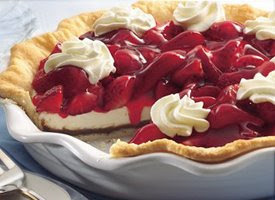 We've make this pie a lot during strawberry season, and have used prepared graham cracker crust, cookie crust, and even substituted strawberry jello for the pie glaze. It is a delicious hit every time. If Life Hands You Lemons Don't Drink The Lemonade! Our friend owns a salvage yard, and last week my husband took Bubba with him to get tractor parts, and they got to see the car crusher in action. Our friend gave Bubba some old golf balls. You'd have thought it was Christmas! Bubba has told me that him, dad, and Boo are taking me someplace special and different for my special day. I'm hoping I don't get a trip to the junkyard! Well I didn't get a trip to the junkyard which I defintely would have preferred to what I got! On Friday I had what I thought was a bout of acid reflux. My prescription meds didn't help. I had a painful sleepless night, and by lunchtime Saturday my abdominal pain had gotten worse. My husband insisted get checked out at the emergency room. So we dropped the kids off at my sisters and headed to the er. They poked, prodded, and continuosly asked me if I knew my name. After a few hours they gave me a thick green concoction to drink, they called it a "gastric cocktail". Then I received what appeared to be a half gallon sized cup of "lemonade". This needed to be gulped down before I could go for a CAT scan. It only stayed down long enough for them to get the CAT scan. For the record, it tasted the same going in, and coming out! CAT results showed a large stone in my gall bladder. Hey who knew I could be like an oyster, and make my own pearls? I spent Mothers Day having my gall bladder yanked out through my belly button, and totally in a drugged up haze. I'm still a little foggy today, so you will have to excuse any typos, and wierd stuff! I have restrictions for the next two weks, and may have trouble with cetain foods, but I am glad to be back home! Next year I'm hoping for a trip to the junkyard! Today's recipe is an easy pork recipe with a tangy, sweet sauce. This was last nights dinner with no leftovers for my lunch today. In a large skillet heat vegetable oil. Saute onion until tender. Remove onion and set aside. In skillet quickly brown pork chops on both sides. Place browned pork chops in a baking dish, and cover with sauteed onions and apples. In a small bowl combine sea salt, black pepper, brown sugar, mustard, cloves and apple juice. Pour over pork chops. Hope you enjoy it as much as my family does! Looking For A Unique Home Business?